In part 2 of this 4-part style guide, I’ll be showing you that size really doesn’t matter when it comes to creating an Enchanted Winter bathroom in a small space. As we’ve already touched upon in part 1, Enchanted Winter is all about dark hues adding a magical, mystical quality to your bathroom interiors. Greys and navy blues combining with warm wood finishes, help to create this fantastical look. Whilst traditional items give us a classic take on the festive season. If you haven’t done so already, why not go back and read part 1? 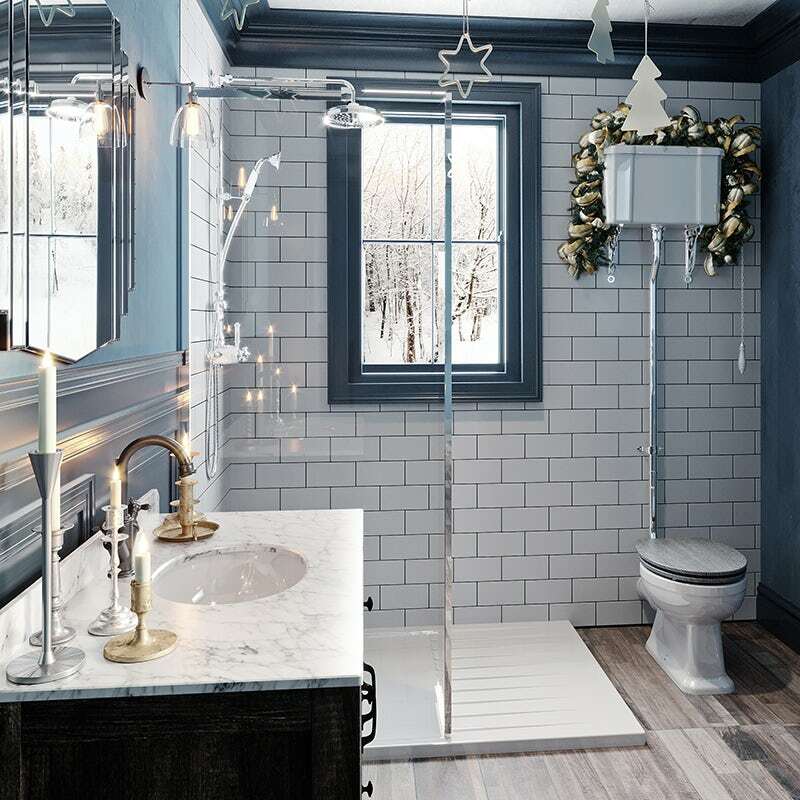 Whilst your average family bathroom may not be quite as large as the one pictured below, you can still use some of the design principles demonstrated to create your own Enchanted Winter wonderland. If you have space for a freestanding bath, make it the centrepiece of your whole room. A tiled feature floor around the bath will certainly help create a focal point. Keep your ceramics traditional in style. The great thing about a high cistern toilet is that the flush pipe can be cut to size, so, even if you have low ceilings, it can still fit in. But if you really don’t have the space, a low level cistern toilet is an excellent alternative which keeps with the same sort of theme. Fairy lights will certainly add a magic touch to your bathroom décor but you will need to be careful. Remember, water and electrics don’t mix, so look for battery-operated lights, rather than those you need to plug in. If candles aren’t practical, there are some excellent battery-operated alternatives, like glow jars. The typical ensuite is usually large enough to accommodate a shower but not a bath, which is why we've swapped the tin bath out for a walk in shower enclosure. As the area around your shower is a splash zone, it isn’t practical to have painted walls or wood panelling, so we’ve opted for white metro tiles which fit seamlessly with the traditional appearance. You could, however, use shower wall panels in place of tiles. Your downstairs cloakroom is one of the only places, along with your living room and dining room, which festive visitors get to see. So, getting your cloakroom ready for Christmas guests should be near the top of your list when it comes to sprucing up your home. One thing many people worry about when decorating a small room is that darker colours will make it feel oppressive. However, this fear is unfounded, as you can see with the fabulous cloakroom space we’ve created. The white of the toilet and marble countertop, along with the wood effect flooring, which extends beyond the boundaries of the cloakroom, give this room a warm and inviting feel. 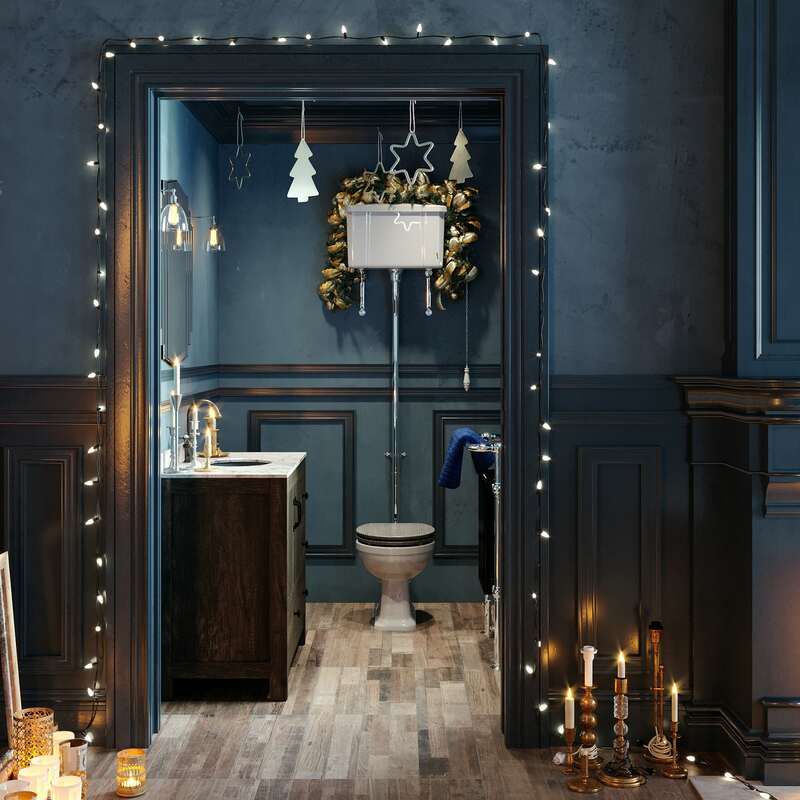 Fairy lights around the door frame will create an impactful entrance, whilst a touch of decoration can be added to your cloakroom around the cistern and with selected, hanging decorations. You'll find plenty more great small bathroom ideas by visiting our Small Spaces hub. One of the most enjoyable aspects of styling a new bathroom is adding all those finishing touches. In part 3 of this style guide, I’ll show you how to dress your Enchanted Winter bathroom with the right colours, materials, textures and accessories. Click on the image below to discover more. In part 3 of this 4-part style guide, it's all about those fabulous festive accessories, as I show you how to dress your Enchanted Winter bathroom in time for that most magical part of the year.